UPDATE: Download the 2019 scorecards and priority recommendations by clicking on the Publications tab. Download the 2017 scorecards and priority recommendations by clicking on the Publications tab. Unhealthy diets and obesity are among the biggest contributors to poor health in Australia. Efforts to address obesity and improve population diets need a comprehensive response, and there is broad consensus on the general areas for action in this area. However, the development and implementation of recommended policies has been slow in Australia and globally. While there has been increased focus on increasing accountability for taking action to address the problem, including through rigorous monitoring and benchmarking of performance against targets, Australia’s performance in obesity prevention is not currently systematically monitored. INFORMAS (International Network for Food and Obesity/NCDs Research, Monitoring and Action Support) is an international network of researchers and public health organisations that aims to monitor and benchmark public and private sector actions to create healthy food environments and reduce obesity and non-communicable diseases globally. INFORMAS has developed the Healthy Food Environment Policy Index (Food-EPI) to assess government policy across 14 action areas related to food environments. 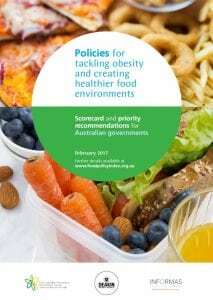 The tool comprises a ‘policy’ component with seven domains each related to specific aspects of food environments that have been shown to have an important impact on population diets, and an ‘infrastructure support’ component with six domains based on the World Health Organization (WHO) building blocks for strengthening health systems. 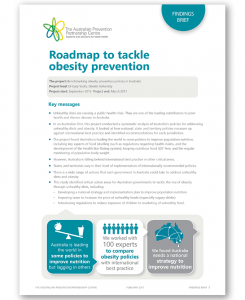 This project implemented the Food-EPI in Australia to benchmark the diet-related aspects of obesity prevention policies of Australia and compare it to international best practice. The policies of each State and Territory as well as the Federal Government were assessed. Government, including knowledge of government officials, relationships within government and with external stakeholders, impact on policy. As part of INFORMAS, the Food-EPI data from this project were added to data collected in other countries to form a database of policy action worldwide. This database will ultimately be used to compare policy implementation across countries and over time. Identifying priority areas for action in Australia to improve food environments. The project directly assessed the degree to which policies in Australia are meeting best practice guidelines for improving food environments, and identified priority areas for action in Australia to improve food environments. As part of the project, the extent to which each jurisdiction in Australia is implementing globally recommended policies was assessed, and priority actions for each government identified in 2017 and then again in 2019. Download reports for Australia and each state and territory below. National media launch, February 20, 2017. A sample of the media coverage is listed below.